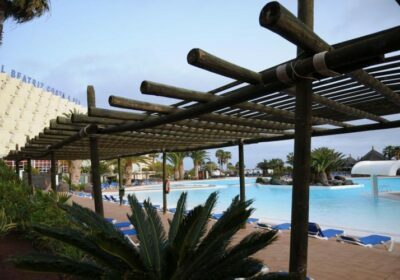 Beatriz Costa Teguise Spa Hotel Free Child Places Costa Teguise, Lanzarote Holidays @Web2travelDeals. Online Since 2000. The Beatriz Costa Teguise and Spa Hotel is a perfect place for a relaxing getaway as it has a nice quiet location away from main centre of Costa Teguise. Enjoy an exceptional level of service, relaxed atmosphere and great food. Very clean rooms. Plenty of sun loungers. Delicious food with a wide choice of dishes available, and no problems with seating in the dining room. Spacious rooms are cleaned every day. Claim your Free Child Place Now for your Beatriz Costa Teguise Spa Hotel Package Holiday. Free Child Places are limited and may be sold out for peak dates. Our advice is to click the link above to check availability of Free Child Places. If you see one available, grab it whilst you can and book your holiday with Low Deposit. All guest rooms are provided with air conditioning, satellite TV, minibar, safety deposit, hairdryer, balcony or terrace and a full bathroom including telephone. As well as the impressive outdoor complex, this hotel also offers spectacular indoor gardens featuring waterfalls and a stream. There is also a large indoor swimming pool and a further heated swimming pool. The hotel also offers petanque, archery and mini golf. There is an on-site animation team that organise a number of daily activities and evening entertainment. A kids club is also available. Please note guests must be aged 14 or over to use the spa facilities. The hotel offers a main buffet-style restaurant serving a range of international cuisine with theme nights and show cooking. There is also a poolside snack bar. The Niagara Saloon Bar offers live music and shows nightly and there is also a piano bar. Guest services includes a 24-hour reception, currency exchange, lift access, laundry services, room service (limited hours) and hair and beauty salon. Prefer a Sunshine Hotel or Flight plus Hotel Deal?